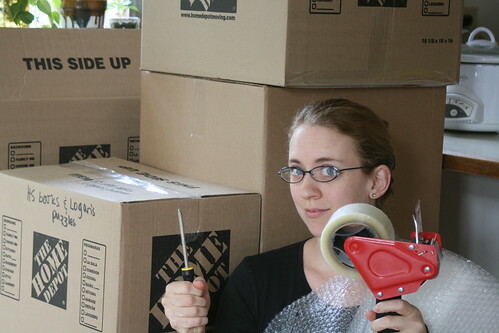 Notice the slightly manic look, the bubble wrap, the dirty hair pulled back into a ponytail (which she is pretending passes for a shower), the desperate grab on the Phillipp's screwdriver, the tape gun. This woman is on the edge. The kittens are weathering this part of the move well. Who knows how they will do when we actually get to the new house... but I am sure they will have tons of fun running around in the rhodies that we have in the back yard. In this picture you can really see how much bigger Samson is than Bo. She is still petite and has a pitiful little mew that sounds broken in the middle. She is just so sweet. He is a typical kitten... adorable, playful... attacks your feet when you walk by. Just so cute. "Why is there cheese in my slippers!?!" Ah, you're moving! I have missed so much during my hiatus! The kittens and adorable and best of luck during the packing/moving journey!